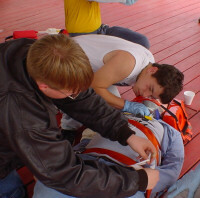 American Red Cross Emergency Response is a class designed for our older Scouts who want advanced First Responder training. This class includes extensive rescue training, advanced CPR and First Aid skills, spinal injury management, extracting victims from unusual positions, emergency child birth, oxygen administration, blood pressure monitoring and use of the new Automated External Defibrillators. The class now includes ARC/BSA Lifeguard Training. Emergency Response with Lifeguard Training requires over 80 hours of classroom, pool and skills practice. This class is scheduled once each year beginning the first Sunday in January. The Emergency Response class is open to all registered Scouts and Scouters, 15 years old and older. Preference is given to our youth BAT and CPR-FA instructors. We suggest that all participants have a current Community CPR or a CPR-FPR card. There are strict swimming prerequisites for the Lifeguard Training portion. Scouts must have the recommendation of their Scoutmaster, parents permission and approval from the Course Director to participate. This is not an easy course… but the reward for successful completion is great! Those who successfully complete the class will receive certificates in Oxygen Administration, Preventing Disease Transmission, Automated External Defibrillation, CPR for the Professional Rescuer, Lifeguarding, BSA Lifeguard, BSA Safe Swim Defense and BSA Safety Afloat. The training looks really good on a teenagers summer job resume! Area pools and the Summer Camp Staff recruiters know the value of this advanced training. What a great way to get started in a medical or EMS career! Scouts with Emergency Response training will have the opportunity to staff American Red Cross First Aid Stations at area concerts, athletic events and at the annual SHAC Scout Fair. They may also serve as senior waterfront staff for the Deer Lake Canoe Clinic. Girl Scout leaders often offer part-time job opportunities helping with aquatic events at local camps. Emergency Response trained Scouts would be a welcome addition to any high adventure patrol. The first class meeting is always the first Sunday in January at the ARC/NBO office in Conroe. We meet at 1:00 PM to complete registration and finalize the actual training class meeting times. This class is "College Level" and requires 9 to 10 weeks to complete. Space is very limited in the Emergency Response class and early reservations always are encouraged. "ER" is a lot of hard work... But it is really FUN TOO!